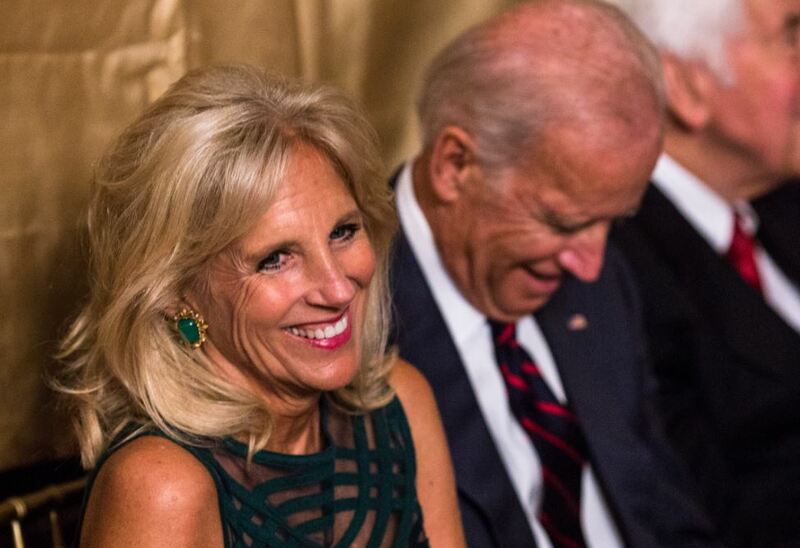 On the evening of Thursday, October 16, 2014, International Student House (ISH) of Washington, DC was honored by a visit from Vice President Joe Biden and Dr. Jill Biden at the Sixth Annual Global Leadership Awards held at their historic facilities located at 1825 R Street, NW. The event began in the early evening with a cocktail reception in ISH’s Great Hall where guests mingled in anticipation of the dignitary and his wife. Upon their arrival, the Award Ceremony commenced with greetings by ISH Board President Grace Tompkins, and by Italian Ambassador, Claudio Bisogniero, this year’s Diplomatic Chair. Dr. Jill Biden then addressed the crowd, followed by Secretary of Defense Chuck Hagel who in turn introduced the Vice President. 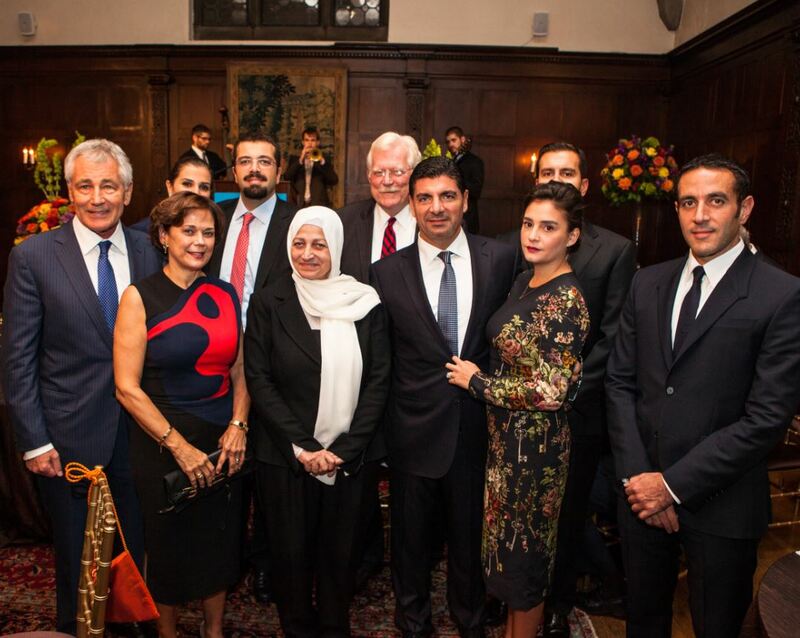 ISH resident scholar Anjelica Aboul Hosn (Lebanon) presented The Family of Rafic Hariri with this year’s Global Citizen Award for their outstanding support for educational exchange opportunities, and their work to encourage civil society, effective governance and sustainable human development. 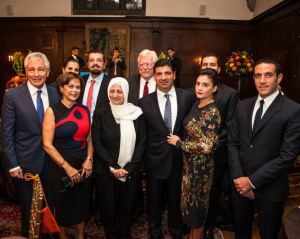 During her remarks, she referenced the Hariri Foundation and its belief, “… that education is the key to sustainable social and economic development, and that all children should have an opportunity to learn, achieve, and reach their full potential, regardless of their economic conditions.” Bahaa Hariri accepted the award on behalf of his family, many of whom attended the event, most notably Her Excellency Bahia Hariri, Member of Parliament and former Minister of Education. ISH also honored former US Senator Richard G. Lugar with its Global Leadership Award for his lifelong commitment to public service, his exemplary bi-partisanship and his achievements in promoting intercultural dialogue and peaceful global citizenship. 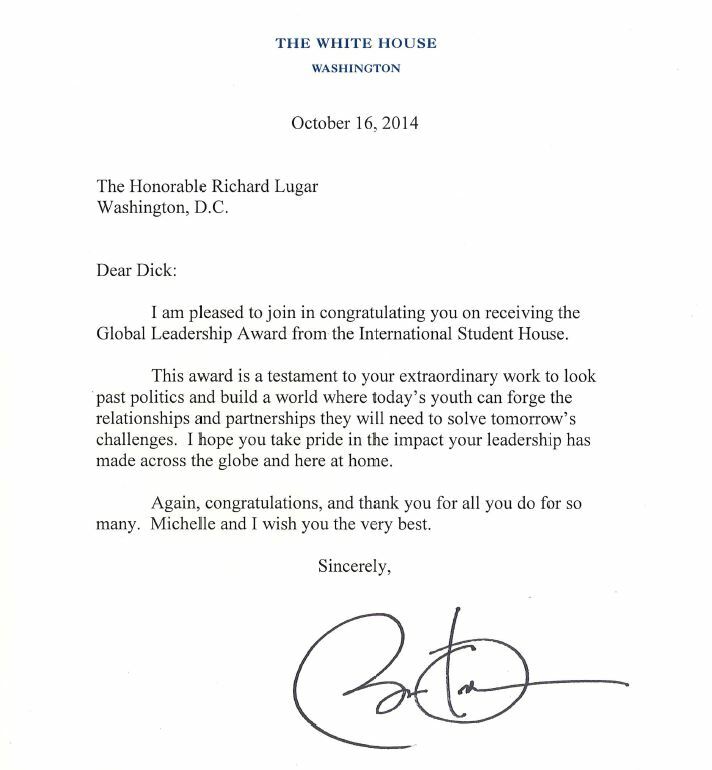 During his introduction presented by ISH resident scholar Taylor Murray (USA), a special congratulatory letter from President Obama was read, click here to read the complete letter. Abraham Akoi, a remarkable young man from South Sudan who lived at ISH from 2008 to 2010 while pursuing both a Master’s Degree and MBA from Johns Hopkins University, was the recipient of ISH’s Distinguished Alumni Award. He was unable to attend. In his place, Wendy Magoronga, an ISH resident scholar from Zimbabwe completing a Master’s Degree from Johns Hopkins University, shared her similar experiences as a student from Africa. Not only does she face the financial constraints of a student from a developing nation studying in the United States; she also awaits challenges as a rising female leader who hopes to return to her country and make a positive impact on its economic progress. An elegant dinner followed in ISH’s dining room and garden where miniature white lights softly lit an expansive clear-top tent. 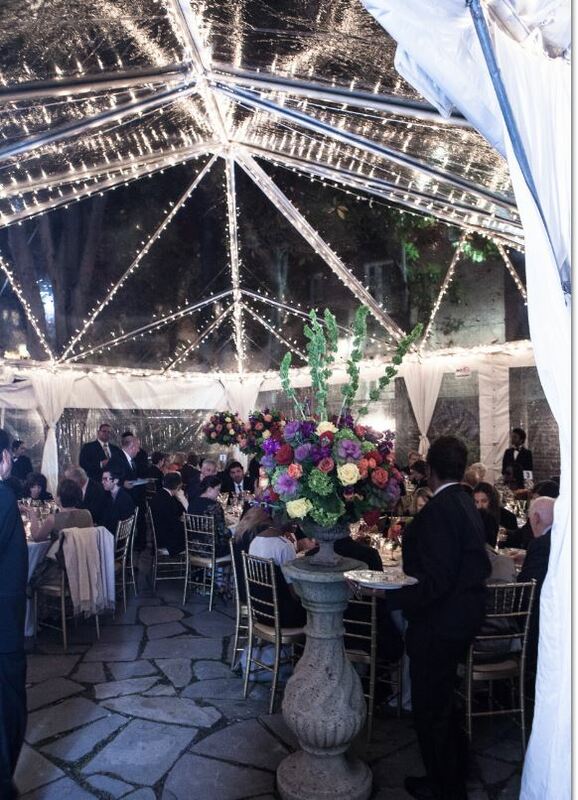 Jewel-toned floral arrangements adorned the tabletops and were placed throughout the Tudor-Style mansion. A jazz trio played as guests were being seated. Other special guests included several foreign Ambassadors and embassy representatives, and Members of Congress. Secretary of Defense Chuck Hagel and ISH-DC Board Member Lilibet Hagel served as Honorary Chairs; Diplomatic Chairs were The Ambassador of Italy and Mrs. Claudio Bisogniero who had graciously hosted a special tribute dinner in honor of this year’s awardees at their beautiful embassy residence, Villa Firenze, a few weeks earlier. Dinner Co-Chairs were Lawrence P. Dunham, former Assistant Chief of Protocol; and Linda Donavan Harper, former Executive Director of Cultural Tourism, DC. Sponsors included Robert J. Abernethy, Jamal Daniel (Crest Investment Company), Lockheed Martin Corporation, Fatih and Eren Ozmen (Sierra Nevada), Gallup, Chevron, Duke Energy, Overseas Military Sales Corporation and others. 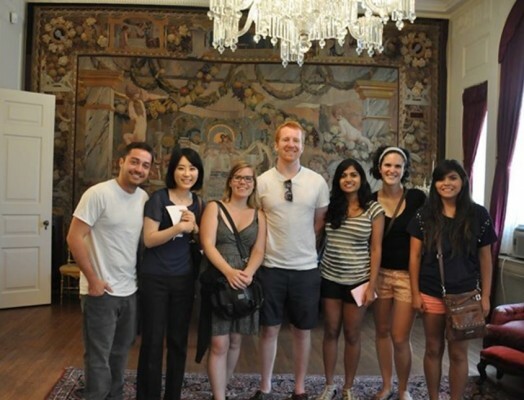 Founded in 1936, ISH offers an unparalleled residential experience to a diverse community of graduate students, academics and post-graduate interns. Over 10,000 scholars representing over 140 countries, including the United States, have passed through the doors of ISH since its founding. 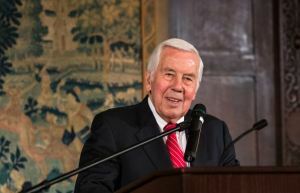 Residents are offered a multitude of activities throughout the year that instill a spirit of cooperation while building a solid understanding of US culture, government and business. Through in-depth programs and a focus on cross-cultural dialogue, ISH strives to be a model international community and represents “soft diplomacy” at its best. 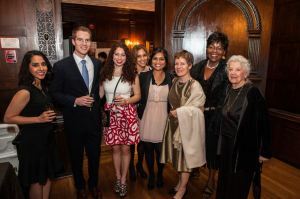 Proceeds from the event allow ISH to continue its mission of providing an exceptional residential experience while promoting peace and understanding. A portion of the proceeds will help support ISH’s scholarship program for students, both international and American, who have financial need. Click here to view the 2014 Global Leadership Awards photo galleries! Team One jumps for joy as they capture the tie breaker photo for the win! 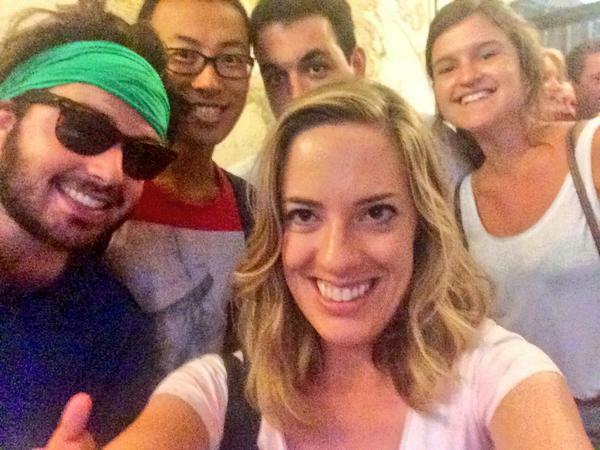 ISH Resident Scholars were on a mission in the National Mall during the @ISHwashingtondc #NationalMall Scavenger Hunt! 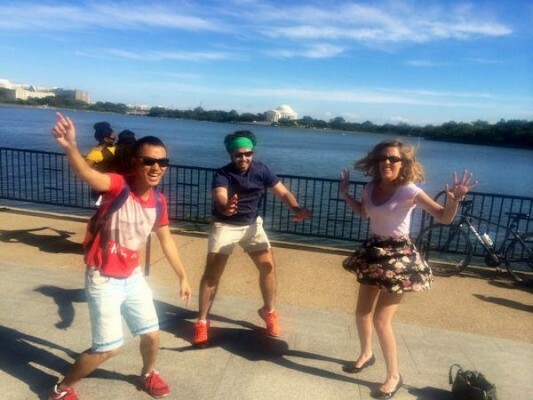 Each team raced to various museums, monuments and historic landmarks while taking photos and tweeting them to the ISHDC Twitter handle, @ISHwashingtondc. A special congratulations to “Team One”. They were the team who collected the most points to win! To see all of the photos from this afternoon’s adventure, click here. Click here to listen about ISH from Cynthia Bunton, Board of Directors and current ISH Resident Scholars! For interested residents who want to see this historical gem, there will be a vintage game night and happy hour at the President Woodrow Wilson House on Wednesday, October 1, 2014 from 5:30 P.M. to 8:00 P.M. Please visit their website for details and to purchase tickets. ISH Residents at the Woodrow Wilson House.